MON 12/19 (5:15PM) — Congratulations to Gold Rush Jewelry from San Jose, which won our premier 6’2″ division of our Gold Rush Tournament (yeah, same name!). 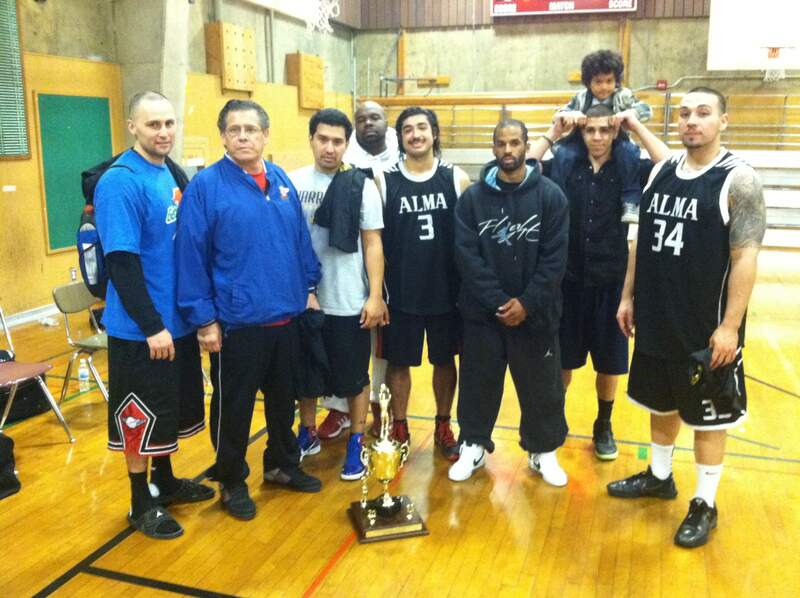 Also congrats to Dream of Oakland which won the one-day 4-team mini-tournament in the AAA-REC division. More info, recaps, and stats to follow in the next few days. Here are the teams in our 8-team 6’2″ division, which to me has the most parity I have ever seen in any of my tournaments. Please note, I will be bringing the tape measure, so be prepared if your seemingly 6’3″ player gets protested on. I simply have to do my job. The following is the best write-up that I can muster up. Sorry if I left out key players and obviously the teams I am more familiar with will get more buzz. Sure, I would’ve preferred to call each one of you and get all the details, but quite frankly it is better to just put down what’s in my brain and see how things play out on the court. We’ll be keeping full stats and everything should post by the end of the year. Format is this: split the 8 teams into two pools of 4. Amongst those four, setup a “mini-final-four” bracket so that we can better seed all the teams #1 thru #8 for Sunday. Yes, all teams make it to Sunday, which guarantees you three games played (2 Saturday, 1+ Sunday), and also means you can screw up a little on Saturday with no consequence to your championship hopes on Sunday. This is the Dream League way. There is ONE scheduling quirk for Saturday: Tru needed an early and late game, so we forced them to be at 430p for the 2nd game, no matter if they win or lose. That means Filcom is definitely playing at 230p, win or lose, and Money Tree and Hibachi need to figure out who they match up with immediately following their game. Pool play on Saturday was determined almost entirely by the following: (1) your fickle schedule needs, (2) if you were one of the first teams to pay, you got a more favorable schedule in terms of less gap between games, and (3) a little diversity of schedule, such that teams that have seen each other in previous tournaments, we tried to avoid. On Sunday, with only one gym, if you scroll down below to see the schedule, we have four quarterfinal games to get out of the way. So I gave the greatest gap to #4 (which carries along with it opponent #5), then #3, then #2, then #1. So unless anyone has any objections, obviously if you “earned” the #1 seed, you also earned the better schedule with less gap in between. The other special Dream League thing that we do when seeding is, we don’t repeat any matchups from Saturday in the first quarterfinal round. That way no one goes home being immediately eliminated by someone they beat on Saturday. If we come across a repeat matchup, we skip to the next-lowest seeded opponent. For example, if #1 already played #8, then we would skip to #1 vs #7 and #2 vs #8 for the quarterfinal on Sunday, assuming both those matchups also were not played in pool play. Don’t worry, this doesn’t happen a whole lot and when it does, the adjusted seedings usually still make sense. This also counterbalances the possibility of one pool being stronger than the other. We’re also gonna have a 3-Pt Contest all day long in between games and at halftimes, at your discretion, and the winner will receive two tickets to the Monday Night 12/19 game 49ers vs Steelers. More on this later. Filcom (Hayward) — a previous two-time champion of Dream League tournaments (here’s one I randomly found), this collection of all-stars from Hayward’s filcomhoops.org is most notably led by pg Kenny Evans and power forward AJ Samson. Tru (SF) — I’m still getting familiar with these guys, esp not knowing too much about their frontcourt, but they’re led by captain Mike Jaranilla. In league play recently, they’ve become most known for their 6FT guards, including Jason Jangar and Brad Nakano. Money Tree (SF) — This stalwart Dream League tournament team is actually an offshoot of the Dream League All-Stars Asian traveling tournament team, of which the reins were eventually given to coach/GM Torrent Lee. John Parsons is the MVP-caliber talent leading this team, although an ankle sprain suffered just days ago leaves him questionable. Taraz Lee leads the team at the big point guard position and is one of our tournament history’s greatest defenders. Matt Lee of UCLA walk-on fame is also a primary weapon. San Jose Hibachi — The multi-league champions from Dream League’s San Jose location finally makes its first appearance in one of our tournaments, and we are delighted to have them. They are led by the athletic Aaron Buckner, steady pg and captain Nathan Lee, and rebounder Matt Trower. Gold Rush Jewelry (SJ) — This is an offshoot of coach/GM Joe Molina‘s Open/Hispanic squad. His teams have won many tournament championships, including the big Tommy Nunez one in Phoenix. It is a pleasure to welcome them into the Dream League community for the first time. Stunners (SF) — Captain Pat Ayson has been handcuffed recently since this team’s last appearance a year ago in our league play, with general injuries and unavailability, as well as their 6’4″ talent being too tall for this division. Ayson and guard Nick Victor will be bringing a patchwork team from their LA SportsClub league, which includes the best point guard from that league. Delano Killa Beez — We welcome back the multi-tourney-champion’s finest from Central Cali, led by the clutch play of shooter/captain Larry Kerchner, the body-shape-defying Jonathan Mamauag, and the timely rebounding of Jared Luque. There will likely be another player or two stepping up as there always is for this franchise. Allstars (SJ) — Sponsor Ralph Hodgen usually enters teams in Open divisions, but with not enough teams in that division this year, he turned to captain Reed Rasberry, who will probably bring some of his teammates from Dream League squad Undrafted, which is one of the most solid teams we have in the Oakland location. I’ve already discussed the 6’2″ division’s Sunday proceedings above. For the AAA-REC division, you can see that we have the following four teams in these logistics-sensitive brackets: PLU vs Dream and Heatonkees vs Hawks, then winner vs winner and loser vs loser. Yes, the champion gets t-shirts. You have all paid extra for that. Also, we tacked on an extra $5 to cover the additional expense of WKRC gym. So originally the cost was $160, tack on $20 (times 4 teams) to cover the cost of championship t-shirts, and tack on $5 = $185 total entry fee, which includes refs. So you are NOT required to bring $25 cash for the refs as you would during league play. No height restriction, any ethnicity. Pool play format (2 games) on Saturday. Single-elimination 8-team playoff on Sunday. Limited to eight (8) teams. SAVE YOUR SPOT, SIGNUP EARLY!!! First six teams to pay deposit get a discount. Now that there looks like an Open division, we’ll have this division for the teams with mostly 6fters plus a center. Not sure how tall that center can be. Teams: Rangers, Marin, Delano Killa Beez, Shootout, Stunners, TDS/Prabe. Tallest player oncourt is maximum __ (TBD, depends on Asian, etc.) w/o shoes, can be any ethnicity. Remaining 4 oncourt players 6’0″ w/o shoes and under can be any ethnicity. 8-team Consolation Format (like traditional high school or Japanese League tournaments). 2 games Saturday, 1 game Sunday if you didn’t lose both on Saturday. Teams that are looking into this: Jumpmen, Stunners, Too Short, Barons, DL Scorekeepers. No one can be taller than 6’0″ without shoes, any ethnicity. Last year’s teams were merged with the 6FT-PLUS-ONE division. All players must be 6’0″ w/o shoes except for next bullet point. One player oncourt can be 6’2″ w/o shoes or by permission from opposing teams, Commish. Please do not overstack your teams. This is for competitive teams not strong enough for AAA. May be combined with REC if due to lack of teams in either division. 8-team Consolation Format (like traditional Japanese League tournaments). 3-game format can still accommodate 6 teams or 4 teams. Special discount for 2011 Fall AAA-SJ, AAA-SF, AAA-OAK invitees. Invitees will be notified by email and will start at the top, then go down until the spot is filled. NOTE: WE MIGHT COMBINE THIS WITH A MASTERS DIVISION. DETAILS FORTHCOMING. Please do not overstack your teams. This is for for-fun-only, not strong enough for AAA-REC. May be combined with AAA-REC if due to lack of teams in either division. Don’t forget to REGISTER and PAY.